DAVENPORT — Katie Chang is not only a beautiful young actress with Rock Island roots who has worked with some of the biggest names in Hollywood. The 20-year-old — granddaughter of Rock Island’s John Scally and daughter of an Alleman High alum — is also remarkably free of ego, wise beyond her years, incredibly level-headed, professional, down-to-earth, friendly and generous with her time. With four films already under her belt, Ms. Chang visited the Creative Arts Academy of the Quad Cities last Friday, to offer students a peek behind the cutthroat show-business curtain and encouragement to pursue their artistic dreams. “This is a business of rejection,” she said matter-of-factly. “You can do 50 auditions before you get one callback. That’s definitely been a huge thing I’ve had to learn. I’m not good at it. I’m just angry. A graduate of New Trier High School in Winnetka, Ill., Ms. Chang started doing community theater when she was about 7, and at 13 she started studying at the Actors Training Center at the Wilmette Theatre in suburban Chicago. She won a part in her first film, Sofia Coppola’s 2013 “The Bling Ring” at 17, after Ms. Chang responded to a casting notice for a 17-year-old Korean-American girl. Last week, she said it was a bit easier to snag that role in the ensemble picture, since it was such a specific part she fit. Just a few months after that debut wrapped, Ms. Chang completed the Rob Meyer-directed film “A Birder’s Guide to Everything,” which stars Sir Ben Kingsley (Oscar winner for “Gandhi” and villain in “Iron Man 3”). Her third film, “Anesthesia,” opened last month at New York’s Tribeca Film Festival. In the drama from Tim Blake Nelson, a Columbia University professor of philosophy (Sam Waterston) is mugged on the doorsteps of an apartment building. The film (which co-stars Glenn Close, Kristen Stewart and Corey Stoll) delves into the chain of events that precipitates the attack, and the lives of the characters the incident brings together. Ms. Chang said it was convenient to be involved in that production, since it was filmed at Columbia, during her freshman year at the Manhattan institution. 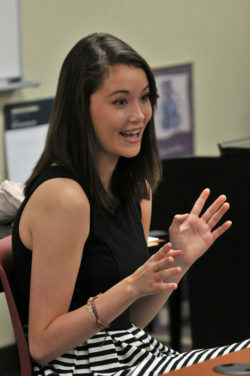 She told the Q-C students she wanted to pursue higher education instead of directly going into show biz; she is transferring to Northwestern University’s drama program (in Evanston, Ill.) this fall. Ms. Chang’s newest project, “The Outskirts,” is another ensemble film, due to be released Nov. 6. After falling victim to a humiliating prank by the high school “Queen Bee,” best friends and world-class geeks, Mindy (Eden Sher) and Jodi (Victoria Justice), decide to get revenge by uniting outcasts of the school against her and her circle of friends. Ms. Chang is featured in the comedy film’s poster of the group. She told the CAA students she wished she had this kind of arts program (which integrates music, theater, dance, art, photography and other arts into the regular curriculum) when she was younger. Keep up-to-date with the latest info. Sign up for Summer 2019 Student Workshops at the Creative Arts Academy of the Quad Cities!! Would you like to help? We need your support now, more than ever! Checkout what we’re up to! Simply enter your name and email! We will send you notifications of activities that involve area students and/or benefit artsBASICS. By providing your email you consent to receiving occasional emails & newsletters. Simply enter your name and email! We will contact you to inquire further as to how you can assist artsBASICS to help our area students.